Fruitless Pursuits: The Book Was Better Podcast Episode 22: Batman Forever! The Book Was Better Podcast Episode 22: Batman Forever! The Book Was Better is a podcast where Jessica McLeod and I take the hastily-written tie-in novelisations of your favourite genre films and discuss, dissect, mock and make gross innuendo about them. 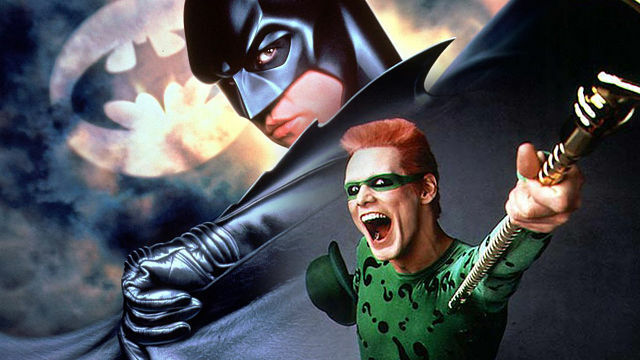 Today we witness esteemed comic scribe Peter David’s desperate attempts to justify Joel Schumacher’s fabulous first entry into the Batman franchise, Batman Forever! Can you believe that David takes a full 65 pages of small print text before he even catches up with the events of the film? You will! This one is a colossal challenge, even for Bat-fans! Find out all about it by stabbing us repeatedly into your ears! Download Episode 22: Batman Forever from the official site or subscribe to us on iTunes!